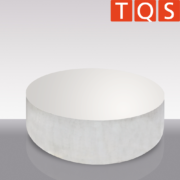 Quartz glass raw materials are available in various forms, grades and qualities. We supply e.g. Spectrosil® 2000 quartz glass windows and panes. Its high homogeneity in connection with its purity in the low ppb-range and being nearly completely bubble free characterizes Spectrosil® 2000. Ingots from synthetic quartz glass meet even highest standards in the IC-industry. Various melting processes will yield the most suitable quartz ingots according to their further downstream conversion. Spectrosil® 2000 in form of blocks and panes is perfectly suitable for applications in low UV-range. 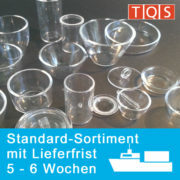 Upon customer’s request TQS supplies customized quartz glass ingots or blocks into a wide variety of shapes, e.g. windows, panes, blocks, prisms etc. We are pleased to present our new homepage and our new Webshop. Our revised internet presence is now more clearly structured, offering extensive information in a new graphic design to all partners, customers, and technically interested parties. The focus is on a clear presentation of our products as well as a clear and structured user interface. All other products, such as custom made products and specific requests from our wide range of variations, formats, and functions, can be requested directly from TQS. Colored buttons above the products provide the possibility for easy and uncomplicated contact with an in-house specialist. For a detailed consultation and answers to your questions, we are gladly available to take your calls. We hope that you enjoy our new homepage and are able to find everything you’re looking for!